Led "Future Concept" team that was charged with improving all brand and restaurant elements. Included extensive strategic background work to determine opportunities in the market and overlay those with Quiznos brand equities. Background work was followed by detailed consumer research and then ideation of many concept alternatives and further refinement via consumer testing. 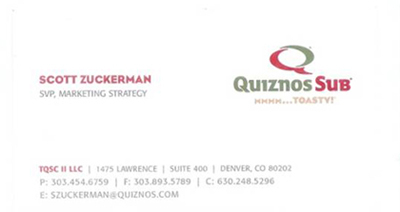 Numerous concept elements were incorporated into Quiznos concept.